Finding a phenomenal skin care product that works from a brand you trust can be such a pain. I’ve pretty much tried every drugstore brand of face washes and moisturizes out there and have been disappointed by all of them. I finally just resorted to only using coconut oil because it was the only thing that was natural enough for me and didn’t make my skin worse. I had pretty much given up on finding a decent facewash and moisturizer. Then a friend introduced me to some FRÉ samples. (Pronounced free.) 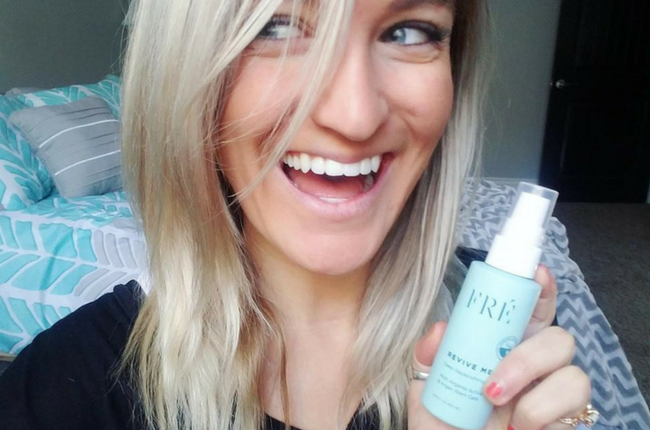 I had heard of FRÉ and that they made skincare products particularly for women who workout. I gave them a try, not expecting anything special. But after a few days of using them, I could already tell a difference! Plus they smelled great and were made with natural, vegan ingredients like Argan oil. A couple months later and after researching the company and the ingredients they used, I was on board with FRÉ 100%. Now I’m happy to announce I’m an ambassador for FRÉ! Now that being said, it is my first priority to ALWAYS be real with you, my reader. I have never and will never promote something I don’t already use or believe in. My goal is to help my readers with their overall wellness, not make a quick buck off of you. I don’t know about you, but I know of very little companies who do awesome things like that.